good luck to atrios, and the corner at national review online, who are holding pledge drives to garner enough money so they can blog full-time without worrying about a job. that being said, don't get us started about bloggers asking readers for money. we've gone over this before, and pissed off all of our blogger friends in the process. what we do in blogtopia (aside from yes! coining descriptive phrases of where we do it) is to cull information from cyberspace and organize it in creative and easy-to-digest ways. it's an important task. but it's not so important that people owe us money for it. really. if you want to be a writer paid for writing, do it the regular way. write a whole lot. submit a whole lot. get rejected a whole lot. sell a little. write a whole lot more. submit a whole lot more. get rejected a whole lot more. sell a little bit more. come on, kevin drum is doing it. we assume glenn reynolds and eric alterman are getting something from msnbc for their time. (we could be wrong. it's been known to happen). the truth is, it's tough to make a living doing anything creative (and blogging is not anything, if not creative). ask us how hard it is. 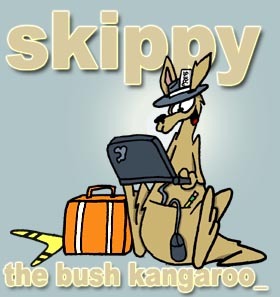 we at skippy international have not had a day job in over a decade. it's no bed of roses. it's difficult more often than not. there are ups and downs and many, many arguments with mrs. skippy about getting off our butts and getting a real job. and it has not been done by asking for contributions. loans, maybe, but not contributions. but who knows, maybe the world is on the verge of a new information-distribution revolution, and somehow the readers of blogs will create a market-sustaining income for their favorite bloggers. but, having seen the results of epublishing over the past five years, we would not hold our breaths. folks, blogging is more like a really good pick up game than a professional basketball event. and asking the kids watching your shirts vs. skins practice to pay your bills is a bit of hubris, if we say so ourselves. if you can't support yourself and engage in a hobby, even a hobby as exciting and important-feeling as blogging (which, after all, is just getting your opinion out there), then, give up your hobby. now, don't get us wrong. we'd love it if atrios (and even the kids at the corner) can create a lifestyle so that they can blog all day long. and for anyone that wants to donate to that end, more power to you, and god bless us everyone. and for all the bloggers with a paypal button or amazon wish list, if that's what gets you through the night, fine. but we think it's a bit much to ask people to pay us directly to hear our opinion. we'll give it you for free. and if the time comes that we have to get a day job, then we would hope to use our spare time at night to bring you our view of the world. and if we're too tired or time-consumed to type our version of the news on a keyboard, well, then, maybe our version wasn't all that important in the first place.